A test submitted by E. I. DeNemour & Company to an independent test lab showed the following properties of facsimile®: Test Piece approximately 1" by 1/4 Thickness. Compression Test Maximum load 6,800 lbs. Compression strength 9,650 PSI. Water Absorption (24 hours at 73º) 0.31% by weight The kit contains all material and instructions. 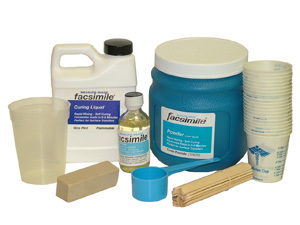 The facsimile® can be diluted from a putty consistency to a watery to best suit your job needs. If larger quantities of facsimile® are desired they can be ordered in 3 lb. and 25 lb. kits at proportionately lower prices per pound. Facsimile is a special plastic compoiund kit which is used for duplicating surface flats, roughness and for dimensional transfer of inaccessible locations. Many other applications are listed below and many more in our free 24 page applications booklet. Makes duplicates for measuring, such as gages, etc. To create a master or checking gage, just pour in facsimile® and wait 6 to 8 minutes. Parts later can be conventionally ground, machined, etc., if desired. Drawing above shows creation of a thread gage. A quick and inexpensive method of creating a drill fixture , just pour facsimile® around drill bushings and wait 6 to 8 minutes. Casting must be a thick section 3/8" or more. Use magnets to hold plates. Without removing work from the machine set-up you can create a facsimile® test sample which can be carried away for testing. Duplicates from 3 to 1,000 Microinches perfectly. Highly accurate and reliable casted replicas of internal thread forms are not only possible but they are being performed daily by facsimile® users the world over.